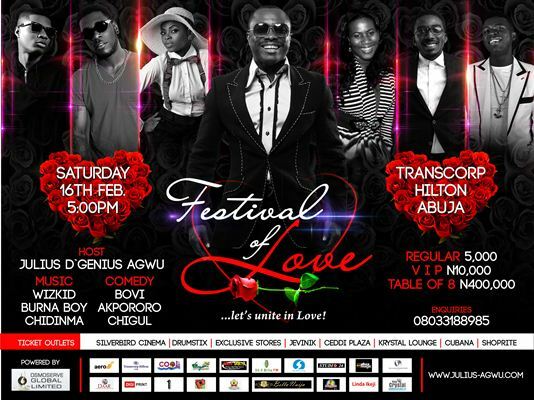 One of Nigeria’s leading entertainers and consummate theatre artiste, Julius Agwu, is ready once again to stage this year’s edition of Festival of Love, an evening of classy music and comedy. In its third edition, Festival of Love has been one of the grand events that captures the true moments of Valentine. Festival of Love is an evening of romantic serenade for couples and lovers, couples' games and great comedy for lovers. Scheduled to hold at the Congress Hall of Transcorp Hilton Hotel Abuja on February 16, 2013, the organizers revealed that Karaoke has been added to this year’s event and that the event will kick start with a cocktail. The music acts billed to perform at this year’s event are leading music sensations- Wizkid, Burna Boy and Chidimma. Comedians slated to knot and unknot guests’ intestines with their hilarious jokes are Bovi, Dan ‘D’ Humorous, Akpororo and Chigul. According to the initiator, Julius Agwu, he said he came up with Festival of Love as an avenue to preach love as the only element that can unite and save our nation at this point. “This year’s event will be an electrifying evening that should not be missed by anyone. The couples games and karaoke will be exceptional. As usual, we leave other surprises for those that will make it to the event. Genuine lovers definitely can’t get a better place to be to celebrate this year’s valentine than Festival of Love”. This year’s event is powered by Osmoserve Global LTD and Aero Contractors, the official career. Last year’s edition featured entertainers like 2face Idibia, eLDee Da Don, Timi Dakolo, Osama, Akpororo, Lepacious Bose, among others. Meanwhile, the frontline entertainer will be releasing a brand new single titled Rejuvenate on February 14, 2013. He said it is his valentine gift to all his fans all over the world. Name: AKAN OSSO. Prediction wud b Nigeria 3 - Burkina Faso 1. A̶̲̥̅♏ precicting. 2-0 against Burkina Faso. The match will end 2:0 in favour of super eagles. I predict Nigeria 2 - Burkina Faso 1. Wldn't mind being at τ̲̅ђe event. Nig 3 - 1. How will u know dose going when d show is on saturday n d match is on sunday? Will love to be there,how much is the ticket per couple? I'v given up on dis cos I know I cannot be amongst the first three! Ngr 3 - Bfa 1. Is it only for Abj folks? Linda please wait leme ask T.B Joshua, He says Nigeria 2 0 Burkina Faso. Burkina Faso 1 - 3 Nigeria >>> Can I get the money instead of the ticket? The match ends 3-0 in favour of Nigeria. Err... all u anonymous folks predicting scores, u do know u can't win anything as "anonymous" right? Why so pained? Predict scoreline simple. LIBs, check out 7 Things You Can Do On Valentine’s Day If You’re Single ( click HERE ), Say no to SUICIDE!!! Over thinking kills!!! Share please. name=shola iwashokunphone no=,08136059628predictions is=3 TO 2 IN FAVOUR OF NIGERIA. Draw, penalty kick. Burkina Faso wins.